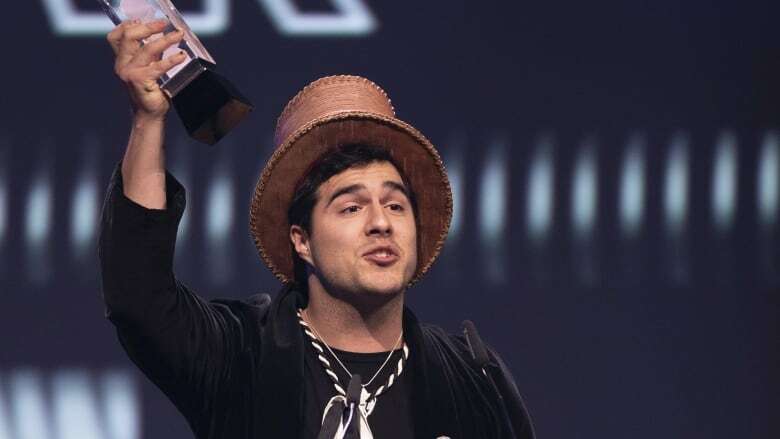 Composer and musicologist Jeremy Dutcher won the 2019 Juno for Indigenous music album of the year this weekend for his album Wolastoqiyik Lintuwakonawa, and he was played offstage before he could finish his acceptance speech. Dutcher did get a chance to finish it later on in the evening, however, when Arkells invited the composer to use their speech time after they won for rock album of the year at the end of the night. Below, you can read (and watch) Dutcher's two speeches in full, including a translation to English in parentheses that Dutcher provided for the portions in Wolastoqey. Psi-te npomawsuwinuwok, kiluwaw yut (All my people, this is for you!). OK Canada, I've got 60 seconds so let's get down to this. Junos, thank you. My team, thank you. My mother, koselmol komac (I love you very much). My family, I love you all, so much. I want all the other nominees in this category to stand up please. Snotty Nose Rez Kids, Elisapie, Leonard Sumner. All of your work changes this place. And it deserves to be considered outside of this category. Because our music is not niche. Our music is saying something. I love you all, thank you so much, for the art that you make. And I'll thank you all in person later. I don't know how much more time — I don't know how many more times they're gonna let me do this: so Justin. Mr. Trudeau. A nation-to-nation relationship does not look like pipelines. A nation-to-nation relationship does not look like sending militarized police force into unceded territory. And a nation-to-nation relationship does not look like, in 2019, our communities still under boiled-water advisory. So. This means so much to me. I hope to continue to share and use this platform to tell truth. We can all do better. Reconciliation [music starts to play Dutcher offstage]. There we go. That's it. Thank you so much. Max Kerman (Arkells): There's been so much wisdom shared on the stage tonight, but our friend Jeremy didn't get a chance to finish. So he's gonna finish the night as he should. Jeremy! And don't cut off the f--kin' — don't start the music. He's gonna go as long as he wants, OK? Dutcher: This is what giving space holds like. This is what holding space looks like. Thank you. To my manager, I'm sorry: I have joined the Arkells. I will not be — they just have, they have a better rider. And it's an honour to be the sixth member? Whatever. [Laughs.] Anyway. As I was saying. Réconciliation. Reconciliation. It's a lofty goal. It's a dream. It doesn't happen in a year. It takes time. It takes stories. It takes shared experience. It takes music. I have hope. I have to. That we can come to right relations with each other. You know? And if at least we're not on the same book at least we're on the same page. I — because at least if we're not on the same page, at least we're in the same book. I should get my anecdotes right. I just want to say this: Nihkaniyayon ktpitahatomonen, ciw weckuwapasihtit — Nit leyic (When you lead us, think of all of us, for the ones yet born — may that be the truth). Thank you.